Actually, one thing does seem odd. In the British Africa list you have A13s and Grants. By the time the Grants arrive, it would be more likely to be alongside Crusaders rather than the A13, wouldn't it? Rivets 'r us: http://theminiaturespage.com/news/talk/msg.mv?id=245126542 … can't believe the Pz2E was suggested and not the Pz3F!! I'll not sleep all night thinking about this. Continuing the conventional design of the Ausf. C, the Ausf. F superstructure front was made from a single piece of armour plate with a redesigned visor. Also, a dummy visor was placed next to it to confuse enemy gunners. The hull was redesigned with a flat 35 mm (1.4 in) plate on its front, and the armour of the superstructure and turret were built up to 30 mm (1.2 in) on the front with 15 mm (0.59 in) to the sides and rear. There was some minor alteration of the suspension and a new commander's cupola as well. Weight increased to 9.5 tonnes. From March 1941 to December 1942, 524 were built; this was the final major tank version of the Panzer II series. 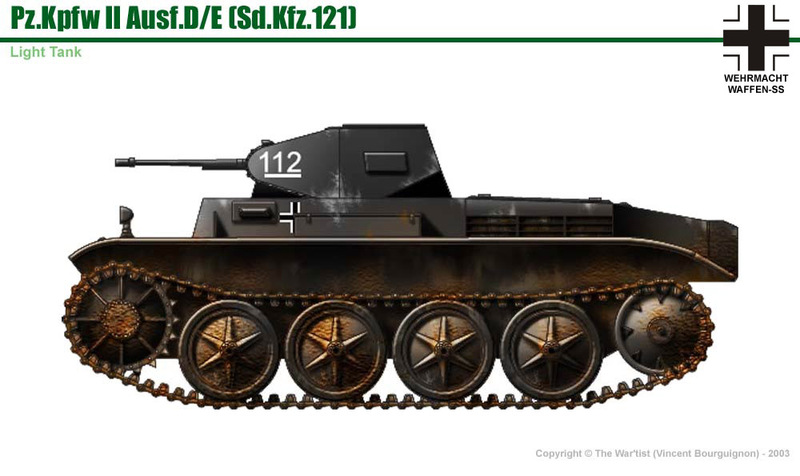 Ah, the Panzer IIE was a completely different tank, with large road wheels, same as the Panzer IID, that was later used as the basis for the Flammpanzer II. It was never used in North Africa. And, as he pointed out, Pendraken only make the F version. Didn't come across as aroused to me, just pointing out a minor error in the army list?